The ‘Safe and Sound’ campaign brings together a number of initiatives that are designed to help carers develop workable solutions to prevent the person they care for from going missing but also get them home quickly if they do. 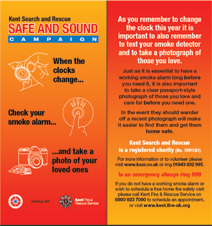 Kent Search and Rescue originally has developed a new initiative that reminds you that, ‘When the Clocks Change, Check Your Smoke Alarm and Take a Photo of Your Loved Ones’. This initiative was developed in partnership with the Kent Fire and Rescue Service. The aim of this initiative is to remind Carers and parents to test their smoke detectors and take a head and shoulders photograph of the person(s) they care for and/or their family members every time they set the clocks back or forward. Getting into this routine will help ensure that you are well prepared for an unanticipated emergency. It is well known that ensuring that you have a properly installed and working smoke detector will help you escape in the event of a fire. Fewer people realize the benefits of having a recent, clear, head and shoulders photograph of the people they love and care for in the event that they unexpectedly wander off and go missing. These two easy actions will help you and the ones you care for stay safe and sound in the event of an emergency. What is more, these photographs make wonderful family keepsakes. 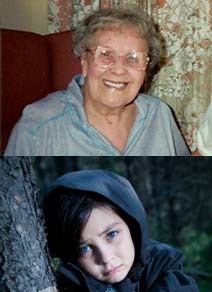 Kent Search and Rescue has developed an initiative called a ‘Life History Questionnaire’. The aim of this questionnaire is to record a range of background information about the person you care for so in the event that they wander off and go missing the Police and volunteer search teams can quickly locate them and bring them home safe and sound. This short form requests a range of information based on years of successful searches throughout the country. You do not need to worry, however, about the privacy of this personal information as we ask you to keep the completed form yourself in a safe place at home and only supply it to the Police or volunteer search teams in the event of an emergency. This is a great exercise for carers support groups to do together. We also include a brief cover letter that explains more about the questionnaire and even gives some examples that may be helpful for support workers to assist carers as they fill out the questionnaire. There are two versions of this form, the first for vulnerable adults and the second for vulnerable young persons, downloadable in Microsoft Word and PDF versions. Need to renew your ‘blue badge’ disabled parking permit soon? When you have their photograph taken for the application print an extra copy, write their name and the date on the back, and store it in a safe place. Not sure if you should still fill out a Life History Questionnaire because your loved one is now in a care home o r secure dementia facility? We recommend that you still fill out a questionnaire so that in the unlikely event that they get confused by their new surroundings and wander away you can provide this vital information to the police and search teams to locate them quickly. This little form can provide a much needed measure of peace of mind.